Provide comfort for the family of Mildred Burkett with a meaningful gesture of sympathy. 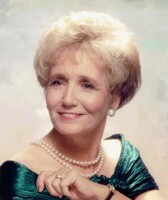 Mildred Louise Burkett was born June 3, 1942 in Vian, Oklahoma the daughter of Doyl and Odia Louise (Miller) McConnell. She passed away December 31, 2018 in Muskogee. She was 76. Mildred grew up in Muskogee, OK and attended school there. She was married to Joe Burkett on February 6, 1958. The couple had been married for 60 years. She worked as a rural postal carrier in Broken Arrow and Muskogee for over twenty years. She loved people and was good at talking with them and making friends. She loved her family and spending time with her children, grandchildren and her dogs. Her family says loved to cook and was very good at it. She is survived by her husband Joe, two sons Jimmy Burkett of Muskogee and Chris Burkett and wife Sandra of Coweta; one brother Ray McConnell and wife Wilma of Vian; three sisters, Carol Bowers Stevens and husband Lonnie of Muskogee, Judy Mraz of Muskogee and Virginia Lammers and husband Arthur of Fort Gibson; nine grandchildren, Christina, Dallas, Tyler, Katrina, Meghan, Hannah, Jessica, Jerrid and Stanley; seven great grandchildren; one special niece Christina Prater and numerous other nieces, nephews, other relatives and friends. She was preceded in death by her parents, one son Thomas Burkett and one brother David Lee McConnell. Funeral services will be 1:00 pm Thursday January 3, 2019 at the Lescher-Millsap Funeral Chapel in Muskogee. Interment will follow in Memorial Park Cemetery in Muskogee. Viewing will be Wednesday from 10:00 am to 8:00 pm at the funeral home. To send flowers in memory of Mildred Louise Burkett, please visit our Heartfelt Sympathies Store.